The new year is here! Maybe it’s the year you decide to finally join that gym, or maybe it’s the year you are going to take the plunge and start a new renovation project in your home. There are so many things to think about when starting a remodel. For many, the most intriguing and fun part of renovating a space is designing what it will look like! We are here to help guide you through that process. This blog is all about some fun new design trends appearing in 2019. The “L” Shaped Kitchen is one of the most popular and classic kitchen designs. 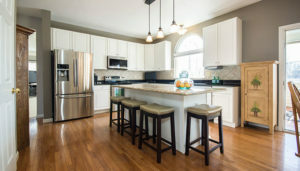 This type of kitchen provides the most design flexibility and offers an open concept. If you are looking for more counter space an L shaped kitchen will leave enough room for an island, while allowing you to still move freely throughout the kitchen. Do you have unused counter space in your kitchen? Are some of your appliances on display collecting dust? Countertop cabinets are a great opportunity to utilize that unused space on your counters. Extend your cabinets all the way down to your counter to add additional storage. 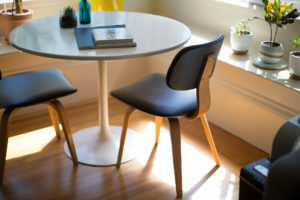 If your space is small, a dining nook is a great alternative to a dining table. When designing your nook, you can choose between a built-in bench or stand-alone furniture bench. It is always good to have options and backups during a remodel. Large or small kitchen, dining nooks are a great place to gather for a meal with family or friends. 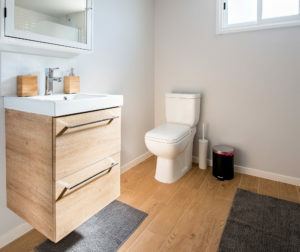 If a bathroom remodel is on your list for 2019, a new vanity probably is too! Natural wooden vanities are becoming very popular. They display the natural grain details so beautifully where darker vanities may hide the knots and details in the wood. Add some color to your new bathroom with a beautiful patterned floor. Moroccan tile floors can be vibrant and colorful or just add a subtle neutral pattern to your bathroom. Designing a new space can seem daunting with all of the choices out there. Don’t let HGTV or Pinterest scare you, these websites and TV shows should serve as inspiration. We will walk you through all of your options to help you create your dream space.